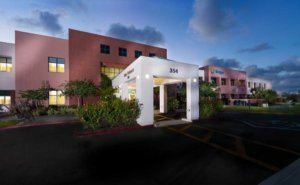 Scripps Memorial Hospital Encinitas is a private, nonprofit, integrated health facility that has served San Diego’s coastal North County communities since 1978. In addition to preventative services and wellness screenings, the hospital provides a complete range of clinical and surgical services, including North County’s first Primary Stroke Center, a regionally recognized brain injury program, state-of-the-art imaging center, 24-hour emergency room care and award-winning OB-GYN, maternal health and infant health services. Scripps boasts an extensive network of thousands of affiliated doctors who work from four San Diego hospitals on five campuses, including four emergency rooms and numerous outpatient locations. Areas of treatment include primary care, urgent and emergency care, and more than 100 medical and surgical specialties–along with home health care and health education classes and support services. Scripps Encinitas Surgery Center has received numerous awards and honors; in 2017 alone, U.S. News & World Report ranked the combined programs of Scripps Green and Scripps Memorial La Jolla No. 1 in the San Diego region, No. 6 in California and among the best in the nation in eight specialties – Gynecology (No. 10), Diabetes and Endocrinology (No. 14), Pulmonology (No. 15), Cardiology and Heart Surgery (No. 21), Gastroenterology and GI Surgery (No. 25), Orthopedics (No. 34), Geriatrics (No. 36) and Nephrology (No. 39) – in their annual Best Hospitals list; The California Association of Physician Groups (CAPG) awarded Scripps Clinic, Scripps Coastal Medical Center and Scripps Affiliated Medical Group with the CAPG ELITE Award for Standards Excellence; and Truven Health Analytics named Scripps Health among the top five large health systems in the nation. Dr. Payam Moazzaz is a resident spine surgeon at Scripps Encinitas, where he specializes in conditions that include back pain, scoliosis, kyphosis, degenerative disc disease, complex spine disorders, neck pain, prior failed surgery, sciatica, and select spinal trauma. He is a premier San Diego spine surgeon.